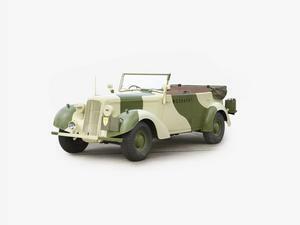 Staff Car employed by Field Marshal Montgomery of Alamein. 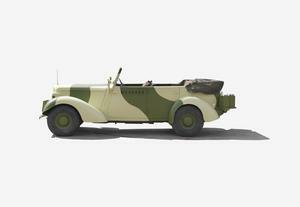 This staff car was used by Montgomery as his personal chauffeur-driven transport while commanding the British Eighth Army in North Africa, Sicily and Italy. Attached to his Tactical Headquarters (The Monty Caravans), 'Old Faithful' was used by Montgomery to visit the troops in the field, and from it he gave his famous 'pep' talks that did so much for morale. When Monty was chosen to command the D-Day landings and returned to the UK the vehicle remained behind and contunued as the pesonal transport for subsequent 8th Army commanders. The car was later shipped back to the UK and presented to its makers, the Rootes Group, who became part of Chrysler Europe in 1967, and who were in turn taken over by Peugeot. 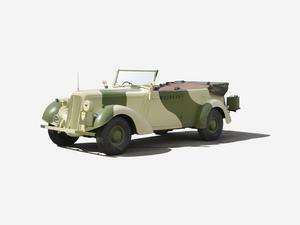 In 1958 the vehicle was placed on loan at The National Motor Museum, Beaulieu and in 1985 the loan was transferred to the Museum of Army Transport at Beverley. 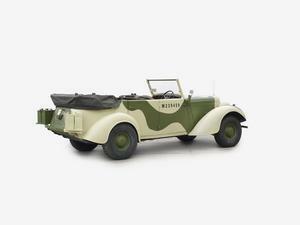 The vehicle was placed on loan to the Imperial War Museum in 1997 and was gifted to IWM by Peugeot in 2010. No records have been found detailing its history between the end of the war and 1958. In 1958 on handover it was serviced by WRAC (formation unknown) and was serviced again in 1959. In March 1960 it was returned to its original coachbuilders Thrupp & Maberly (part of Rootes Group) and returned to Beaulieu repainted in May of that year. It also went on promotional tours to the Rootes Group for two months in 1966 and 1968.